My first David Bowie encounter took place during the summer of 1973 while viewing a "Top of the Pops" segment in Britain. Along with other "glam" rockers of the day like Slade and Gary Glitter, Bowie was like nothing that I -- nor, I gathered, the rest of the world -- had ever seen at the time. While some found him disturbing and feared his unfettered androgyny (hmm... not unlike the modern Marilyn Manson hysteria? 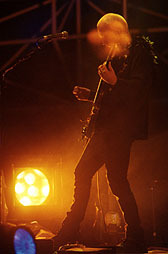 ), for others like myself, his mystery and magnetism made him all the more the modern musical icon that he ultimately became. So the opportunity to experience David Bowie live in a comparatively smallish venue like the Plaza of Nations was indeed a treat. And thus it seems that David Bowie has come full circle from those early days of Blues and Jazz in London's West End. 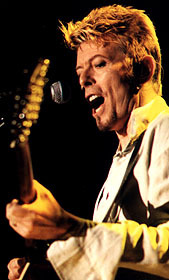 This tour in support of Bowie's latest release, Earthling, skipping over the rumbling hype-laden extravaganza that was the Outside/Nine Inch Nails machine of 1995 and bringing us in a little closer to the man and the music of an active 30-odd year career. The two-hours-plus show started off rather quietly, with Bowie striding onstage and asking the packed, attentive house, "Have you got a few minutes?" 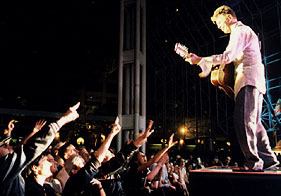 He seemed intent on establishing a more personal rapport with the audience than in some of his other stadium concerts, which was only underscored by his reaching deep into his musical closet to pull out a lot of classic Bowie material. One of the first songs of the evening was a pumped-up, almost techno-fied version of 1972's "The Man Who Sold the World." 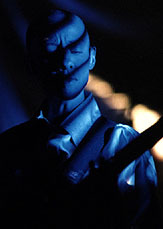 What was truly amazing was how he retained both the acoustic and electric guitar sound of the original recording, yet at the same time had enough keyboard manipulation to keep it in tune with the punchy spacey-industrial feel of the Earthling tracks. 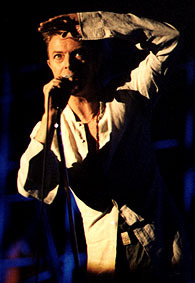 The older material, particularly songs like "Fashion," "Fame" and "Scary Monsters (and Super Creeps)," proved to be particularly suitable to continue the musical thread from the populous-pleasing faves to more modern cuts like "The Heart's Filthy Lesson" and "Hallo Spaceboy" (from Outside) and back to songs from Earthling (from which only "Law" and "The Last Thing You Should Do" were absent). As one would expect of a David Bowie performance, the technical quality of the show was superb. Aurally, it had a driving and almost relentless intensity, with keyboards, electric and acoustic guitars all retaining their own clarity in the mix, yet still cohesively and powerfully invading your head. 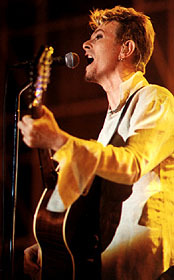 Bowie's 50-year-old vocal chords certainly seemed no worse for wear, which I didn't expect. The combined effect of all this and the constant visuals almost gave the show a two-dimensional quality: it was like watching a huge, ultra-clear video. True, you were inside this contained experience with the real David Bowie, yet it all had an unbelievable sensation to it. Fortunately, Bowie was smart enough to continually pull us back in with seemingly genuine interaction, exuding his usual charm and noting to the crowd at the start of the half-hour encore that "...you know we only go out [offstage] for cigarettes anyway!" Save for the synchronized explosion of a couple of giant eyeball balloons that Bowie tossed out into the crowd, the show was without a lot of the extraneous props and trappings that usually come with the various Bowie personae, which was unusual. He was no other character but himself... costumed in a plain shirt and pants with a simple beaded necklace and gold crucifix. 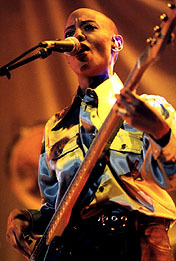 Nearing the end of the evening, we were settled down with a captivating and beautifully sung cover of Laurie Anderson's "O Superman," performed primarily by bassist/keyboard player/vocalist Gail Ann Dorsey [Rodney: a ringer for Skin from Skunk Anansie]. The show finished up with the crowd waving their arms back and forth, singing to "All the Young Dudes" in some sort of harmonic convergence. Bowie then exited the stage with a simple "God bless" and he was gone. Instead of the usual mad dash for the exit, everyone just sort of stood around breathing a collective "wow" as they let go of this riveting performance. Once again, Bowie was in top form, and that's hardly disturbing at all.